Embossable Window Plastic Sheets 4.25"X5.5" 20/Pkg - JUDIKINS-Embossable Window Plastic. 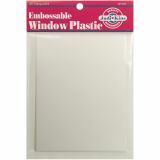 Use these transparent acetate sheets to create window cards, boxes, picture frames, and even jewelry and ornaments. This package contains twenty 5-1/2x4-1/4 inch sheets. Imported.